This Saturday night, in the main event of UFC 231, streaking UFC featherweight champion Max Holloway will attempt to defend his title against undefeated challenger Brian Ortega. Heading into this fight, fans are divided in their predictions. As it turns out, professional fighters are also treading both sides of the fence. BJPENN.com recently reached out to a host of pro fighters to get their predictions for the big fight, and like everybody else, they’re all over the place. Ilima-Lei MacFarlane, Bellator women’s flyweight champion: Max Holloway by unanimous decision. Eryk Anders, UFC middleweight: Brian Ortega by third-round submission. Aaron Pico, Bellator featherweight: Honestly, I have no idea. This one is a toss-up for me. Holloway is pretty much solid all over and you have Ortega’s jiu-jitsu. Should be a good one. Alex Volkanovski, UFC featherweight: If the Max Holloway we know shows up, he wins by decision. Juan Espino, UFC heavyweight: I like the two fighters very much but I am going with Brian Ortega by submission. Maurice Greene, UFC heavyweight: Brian Ortega by submission. I like the underdogs as I am usually in that place. Luis Pena, UFC featherweight: Max Holloway by decision. Tim Johnson, Bellator heavyweight: I believe Max Holloway will win by TKO in the second or third round. He’s anxious to get back in there. Justin Frazier, UFC heavyweight: That is a good fight. Max Holloway by TKO based on experience and grit. Dominick Reyes, UFC light heavyweight: I don’t know. My ONLY prediction is a badass fight! Bobby Moffett, UFC featherweight: I think Max will win. He will use his length and Brian won’t be able to keep up with his pacing. Josh Emmett, UFC featherweight: It’s hard to say what’s going to happen. Holloway is the champ for a reason, but you can never count out Ortega. I could argue how both guys could win the fight. If I had to pick one I would bet on the champ. Muhammad Aiman, ONE Championship bantamweight: I feel like Holloway will come out on top just because I think he has a bigger heart in there. I feel like it’s gonna be a hard fight for both of them stylistically. Fighters picking Max Holloway: Ilima-Lei MacFarlane, Alex Volkanovski, Luis Pena, Tim Johnson, Justin Frazier, Josh Emmett, Muhammad Aiman, and Bobby Moffett. Fighters picking Brian Ortega: Eryk Anders, Juan Espino, and Maurice Greene. Fighters who are undecided: Aaron Pico and Dominick Reyes. 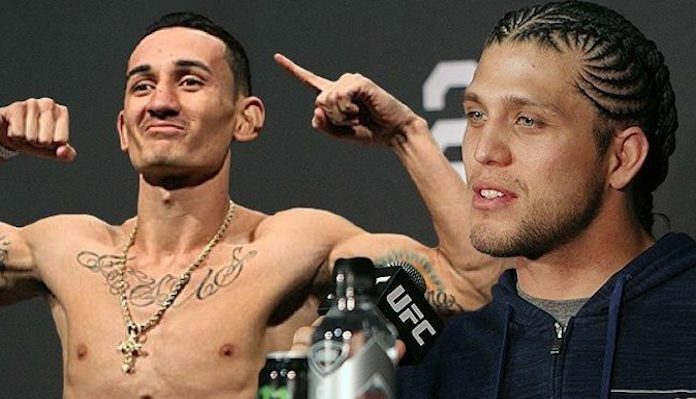 Who do you think will win the fight between Max Holloway and Brian Ortega?